In case you didn't realize it, Emmett loves Toy Story. 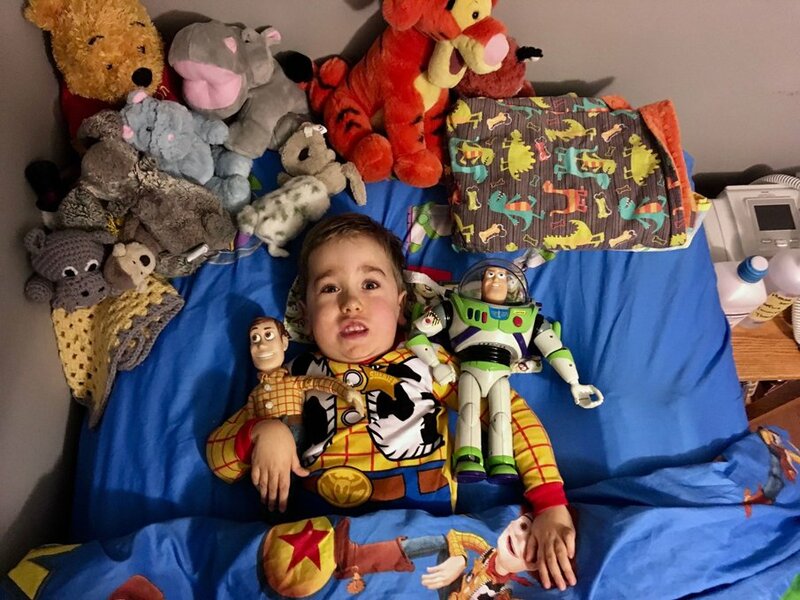 Woody the Cowboy and Buzz Lightyear have been his favourite companions for more than half of his life. This summer when Alisha and Josh started talking about making the move from his crib to a big boy bed there was only one request on Emmett's part. This his big boy bed be a Toy Story bed! Well, fortunately Emmett wasn't talking about a bed that looked like Bullseye's corral or Buzz's space ship. He was fairly open ended on his expectations. Josh and Alisha, however, had a bigger challenge than Toy Story. They had to figure out what to do? You see, a regular big boy bed from any furniture store would mean instant aching backs for any adult supporting Emmett. A hospital bed would provide height and adjustability but is so institutional. So Josh went to Google and started researching bed construction and came up with a plan that had the bed high enough that adults don't have to bend over to work with Emmett. It is still a project in progress as the drawers still need to be built (picture a captain's bed on steroids) and then it will be all set. So you may be wondering, how is a captain's bed on steroids a Toy Story bed! Well, because it has Toy Story Sheets and a Toy Story comforter. That is everything that Emmett needs to make his big boy bed the best thing ever. Of course, Woody and Buzz pyjamas are also very important for this character bed. Is he happy with his Toy Story bed? One look at his eyes in the above photo should answer that. Halloween was either going to be Woody the Cowboy or Buzz. The week before Emmett finalized his decision. He was absolutely and without hesitation going for his second year as Woody. Buzz is a fun costume to dress up as, but Woody is the real thing. Emmett dressed as Woody on Sunday, Buzz on Monday, and then Woody on both Tuesday and Wednesday. 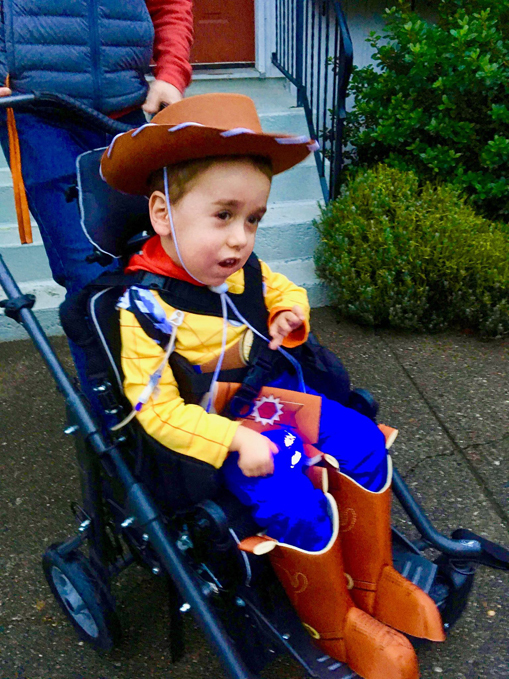 Emmett had to go out on Halloween in his specially adapted stroller because his power chair was in the shop for repairs. Fortunately, it was back in service before the week was up and Emmett had his independence again. Emmett got to go out to a pumpkin patch and was overwhelmed by the range of pumpkins that he found. He selected a great pumpkin and then announced that he wanted it carved like a hippopotamus. If you know Emmett at all, then you know that hippos are absolutely another very important facet of Emmett's life. 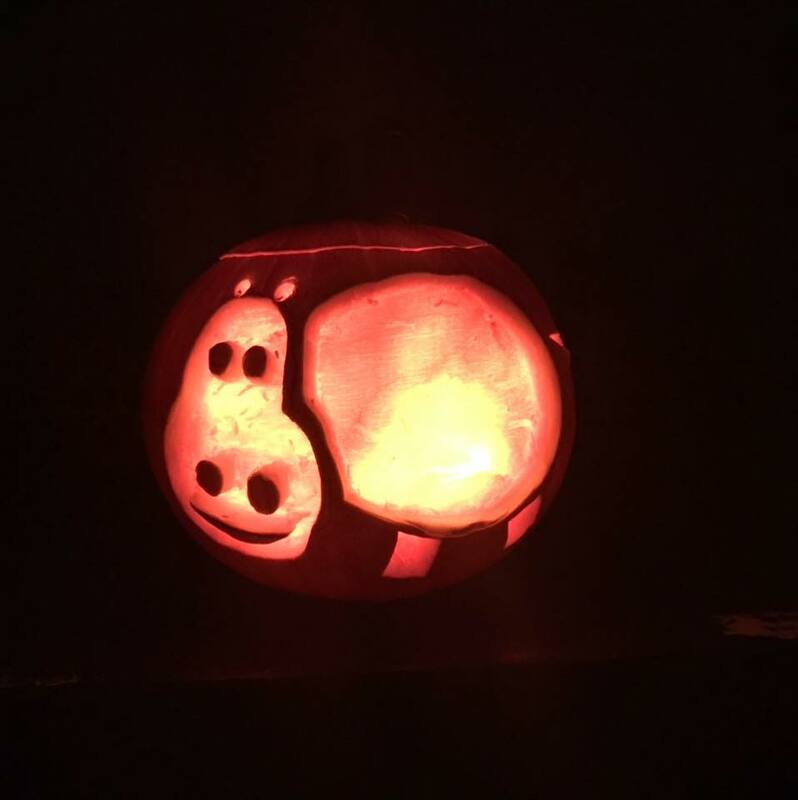 So we got out our pumpkin carving gear and Emmett got what we think was a pretty good hippo pumpkin. Of course, with some trick or treating it was once again an opportunity to discuss with folks the fact that Emmett doesn't eat or drink anything by mouth. So candies and chocolate bars are like toys for him. Something to play with but not to eat. Smarties boxes are still a favourite because they make great musical instruments. A huge thanks to all of the neighbours who helped make Emmett's evening a great one. And the helium balloon and toys you specifically selected for Emmett certainly allowed him to really celebrate. Emmett has been back to the Vancouver Zoo - it really is one of his favourite places. The hippos were busy lying in a mud puddle and enjoying the fall sunshine. The wolf was meandering around the enclosed habitat. 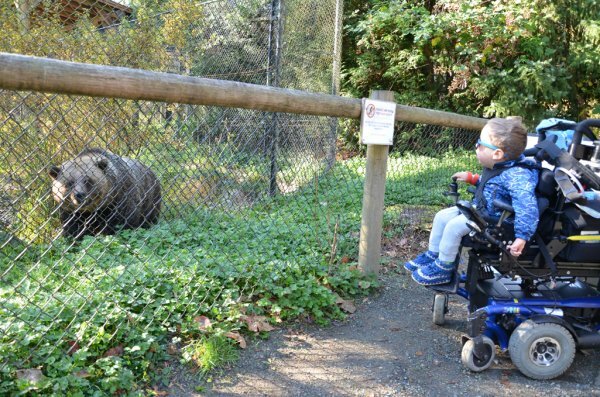 The grizzly bear was right up at the fence and seemed to take an extremely close interest in Emmett ... maybe Emmett's wheelchair ... no, I think it was Emmett. That grizzly tracked us for a while - we were all glad that there was a significant fence between us and even more to leave that area. We were able to get up really close to the moose, saw lots of flamingos, and were able to see the lions sleeping. The lions always seem to be sleeping! All in all, it was a great trip. Emmett's new bike is another great form of exercise for his legs. You see, Emmett's brain messages are gradually getting through to his limbs and, you may recall, Emmett's legs stopped responding when he was about three months of age. Please note that Emmett is not powering this bike in this video - Alisha is pushing it and the direct drive wheels of this Freedom Concepts bike mean that the pedals turn in conjunction with the wheels. This in turn exercises Emmett's legs. We hope and pray that in a future post we can exclaim that Emmett is powering himself! Those legs of his just aren't strong enough yet. In water his legs have been quite active for a long time - as the water reduces the impact gravity has upon him. His bathtub is filled to the top daily for a physical outlet as Emmett floats, swims, and kicks his legs. Alisha exercises his legs multiple times a day. During his quiet time he is in his 'legzerciser 2018' for about 1.5 hours daily getting more movement happening. 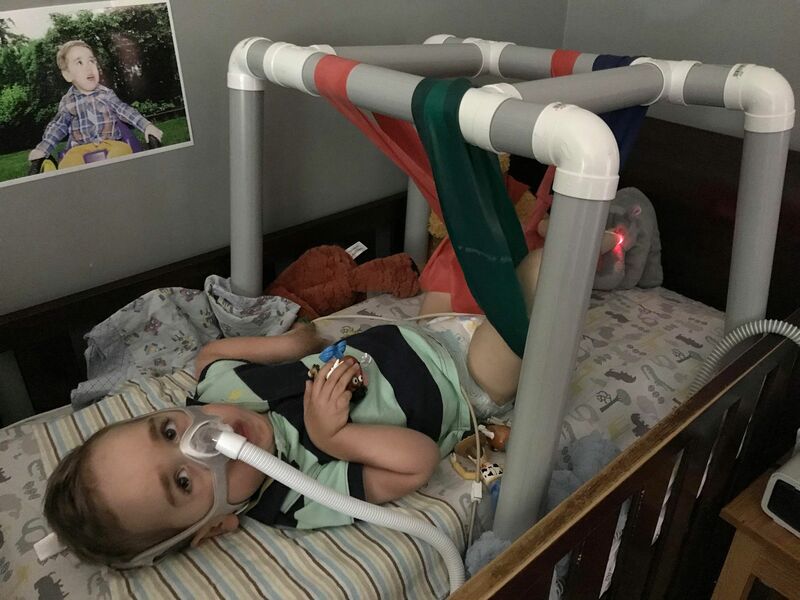 The legzerciser is a homemade device that gets Emmett's legs up in the air where he can freely move them about. Recently while working out with his mom during stretching exercises, he pointed to his left leg which, when mom puts it into an upright position that he can hold upright and vertical for a few minutes, he said "This leg is perfect!". Then he looked and pointed at his right leg, which he cannot hold up nearly as long, and pointed out that "This leg is not perfect". Alisha certainly assured him that she loves everything about him and especially both of his legs. The bottom line: Emmett has always known that his body is different than other kids and, even at his young age, that he is unique. There are so many joys with Emmett and we love sharing those with you. There are also challenges. For instance, Emmett is currently on his second wheelchair. 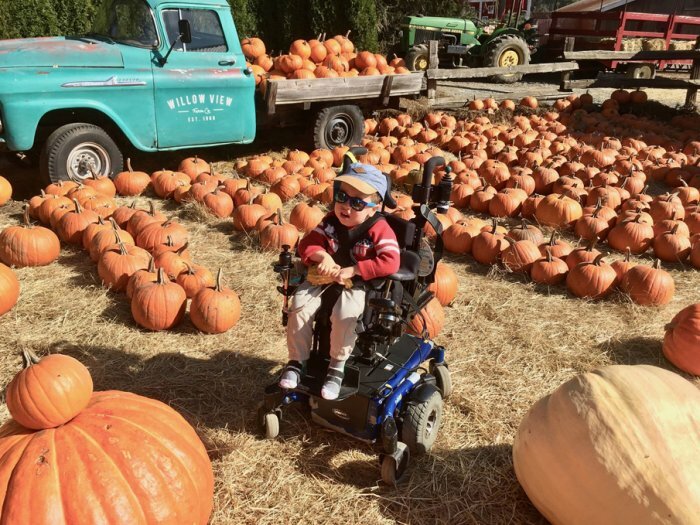 While he has been involved in a mobility study with power chairs since he was 16 months old with chairs that have been provided for him to use, his next chair will be 'his' chair. This is both awesome and a challenge, as a power chair can cost as much as and probably more than many families would spend on a car. The basic cost of the chair for Emmett will be provided but extras - which will be very important for Emmett to have - are the responsibility of the family. We mentioned that his chair was in for some work - the technician indicated that this chair (second hand when Emmett got it) is nearing the end of it's serviceable life. Another challenge is public accessibility. This includes our church. When it is not cold and flu season - which does seem to be most of the year - Emmett loves getting out. He really enjoyed being at Church VBS this year. 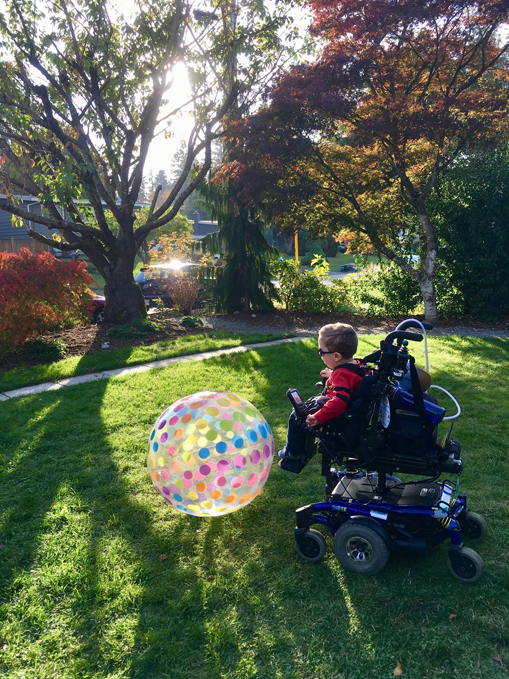 The main floor is accessible and all of the activities that Emmett's age group was involved with took place in the sanctuary, the foyer, and outside. The congregation is looking at the challenge of how to provide accessibility for Emmett and others who require it, but for a building with three levels it is not going to be an easy task. Yet it is an important task to allow Emmett independence and the opportunity to participate. At least, participate when it isn't cold and flu season. Of course, their house does not have a handicapped washroom. That is something that will have to be in future plans. Right now, Emmett has just finished getting another dose of Spinraza. I think that this might have been injection number 13. This took place on Wednesday, November 7th Emmett at BC Children's Hospital - another injection of Spinraza. Another lumbar puncture, to be exact, which is certainly far more invasive than just an injection. The neurologist removes 5 ml of spinal fluid and replaces it with 5 ml of fluid containing the drug Spinraza. Emmett was not looking forward to this. As much as he loves being at the hospital, he recognizes the tests and process that takes place before this procedure. Which he obviously does not like. It went very well and Emmett handled it like a champ. This was a huge relief for Alisha and Josh - because he was very upset in July for his last lumbar puncture. There have been three or four trips to Vancouver over the last two weeks. Check-ups, getting fitted for new orthotics, getting his body brace adjusted, and of course his lumbar puncture for Spinraza. This little boy has a very full calendar. This little boy is growing so much. He is a tall boy and my goodness he is getting heavy! Your thoughts, best wishes, and prayers for Emmett are truly appreciated. Emmett is such a happy little boy. Thank you for loving him with us! He is incredibly special.